A LaHarpe family is dealing with the loss of their family dog after it was shot from behind with a bow and arrow in December. 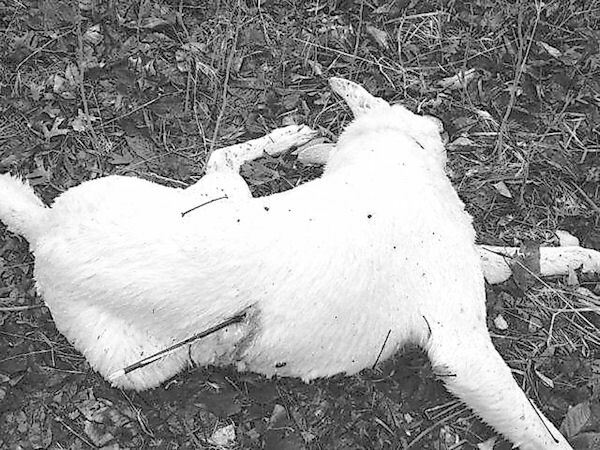 The killing of Bear, a 100-pound white German shepherd owned by David and Barb VanFleet, happened within a few miles of their home. His body was found by the property owner, Gary Eddington. Word got back to the VanFleet's through a friend of their son's at Illini West High School after Bear had been missing for over one month. The VanFleets called Eddington and got information from him. "I called the Sheriff's Department to let them know what had happened," said Barb. "They told us to not go get the dog. (West Hancock Canine Rescue's) Anissa (Sadeghi) and (county animal warden) Mike Wright retrieved his body. We went to the dog pound the next day or two days later. "They wanted some time to examine him to find out what happened. That's when they determined he had been shot from behind." Barb said Bear sometimes wandered in that area, but he always came home. "When he wasn't home the next day, I knew something was wrong," she said. The news wasn't easy for the family, who had another white German shepherd disappear five years ago. "This was especially hard on my husband," said Barb. "He was a hunter. I think he knows what an animal goes through when it is shot by a bow. "My daughter took this very hard. She is a typical girl. She babied him. They ate breakfast together every morning. They were very close." "No person may intentionally commit an act that causes a companion animal to suffer serious injury or death." Illinois law does not stipulate the shooting of a dog unless it is attacking a person or domestic livestock. The area where Bear was found is leased as hunting ground. Sadeghi said there is misinformation about it being okay to kill a dog if it interferes with hunting. "I reviewed the Department of Natural Resources Administrative Code and found nothing like that," said Sadeghi. "I called the Illinois Department of Resources and spoke to an enforcement officer. He told me that is not true. It is only legal to shoot a dog if it is attacking domestic livestock or a person. "Shooting domestic animals without permitted circumstances is a crime. In this case, this was a family member whose family grieves his loss. He was wearing a collar and was shot in the back. Chances are he didn't even see who was shooting him," Sadeghi said. "This could have all been avoided had the shooter contacted the Sheriff's Department who would have called in Mike Wright. He would have taken custody of Bear, and Bear would be alive today reunited with his family." West Hancock Canine Rescue is offering a reward for any information leading to the arrest of the person or persons responsible. Anyone with information is asked to call the Sheriff's Office at 217/357-2115. David and Barb VanFleet of LaHarpe and their family are dealing with the loss of their family dog after it was shot from behind with a bow and arrow in December 2009. The Sheriff's investigation continues of the killing of "Bear," a 100-pound white German shepherd.